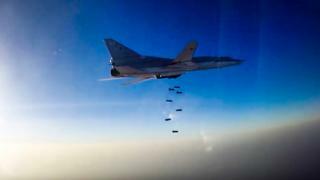 Russia's defence ministry says it has used a base in western Iran to carry out air strikes in Syria. It is reportedly the first time Russia has struck targets inside Syria from a third country since it began a campaign to prop up Syria's president last year. Iran is Bashar al-Assad's main regional ally and has provided significant military and financial support since an uprising against him erupted in 2011. The US State Department said Russia's use of an Iranian base was "unfortunate but not surprising". Asked about moves towards a possible agreement with Russia to co-operate in fighting so-called Islamic State (IS), a spokesman, Mark Toner, said closer Russian-Iranian ties would not necessarily preclude a deal. But he added: "We're not there yet." In recent months, senior Russian and Iranian officials have discussed boosting their military co-operation, reports the BBC's Steve Rosenberg in Moscow. Last week, Russia asked Iran and Iraq to allow Russian cruise missiles to fly through their airspace for attacks on terrorist targets in Syria. Russia has been operating jets and helicopters from bases in Syria for the past year, but this is the first time that Moscow has deployed aircraft to a third country in the region. Reports indicate that up to six Tupolev Tu-22M3 bombers - known by the Nato codename of "Backfire" - are now operating from an air base in western Iran. These planes - originally designed as a long-range strategic bomber - have already been engaged in the Syrian air campaign but operating from bases in southern Russia. Placing them in Iran dramatically reduces the duration of their missions. The Russian defence ministry says that an unspecified number of Sukhoi-34 strike aircraft have also been sent to Iran. Their deployment marks an intensification of the Russian air campaign - perhaps a reflection of the scale of the fighting in and around Aleppo - and it is a demonstration of the growing warmth in ties between Moscow and Tehran, the Syrian government's two closest allies. The Russian defence ministry statement said Tuesday's air strikes had killed a "large number" of militants from IS and Jabhat Fateh al-Sham, a rival jihadist group previously known as al-Nusra Front. They had also resulted in the destruction of five warehouses filled with weapons, ammunition and fuel, and jihadist training camps in the northern provinces of Aleppo and Idlib, it added. Three command centres in the eastern province of Deir al-Zour were also hit. The Local Co-ordination Committees in Syria said 15 civilians had died in Russian strikes in the Tariq al-Bab district of Aleppo and a further two in the Daret Izza district. Another 10 people died in air attacks in the Ommal neighbourhood of Deir al-Zour, the committees said. The strikes came a day after Russia's defence minister suggested Moscow was close to an agreement with the US on collaborating in attacks on IS around the divided city of Aleppo, where fighting between Syrian government and rebel forces has escalated in recent weeks. "We are moving step by step closer to a plan - and I'm only talking about Aleppo here - that would really allow us to start fighting together to bring peace so that people can return to their homes in this troubled land," Russia's RIA news agency cited Sergei Shoigu as saying. The US has conducted hundreds of air strikes against IS and Jabhat Fateh al-Sham militants in Syria since September 2014, but it backs the rebellion. Also on Tuesday, Human Rights Watch alleged that Russian and Syrian government aircraft had been using incendiary weapons in civilian areas in violation of international law - something Moscow has denied.